Obtain feathers. Which can takes years. I like molted feathers rather than from aviary birds that have died. I am fortunate to have a dedicated group of people who take the time to pick the feathers up and send them to me. Some feathers are harder to come by than others. Also I have to pay close attention to the laws about which feathers are legal to have and to sell in artwork. Select feathers. By far the most time-consuming part. Damaged plumes are not usable and often, the majority of feathers I get are in some way damaged. Each bird’s say 10,000 feathers are of all different sizes and colors and I need the exact right size, pattern, and color. Prepare the feathers. The feathers in good shape get washed and sanitized. Each feather gets preened, kind of like the bird does it to make sure the barbs are all interlocking. Most body feathers have a little plume called an aftershaft which I usually, but not always remove. Shafts may need a little cleaning. The cutout feathers are backed with an archival paper; then I cut out the shapes with a small surgical knife blade. I find the much used exacto-knife blades unsuitable. Design the layout. This happens throughout the process but it helps to have the feathers ready in hand to get a feel for the dimensions. Not all concepts fit the most common dimensions I use 11x14” and 16x20”so I create larger custom sizes. I am pretty much a stickler for being exact, following well-proven design space relationships in my arrangements. I mark the places on the piece exactly where each feathers will lay. Make the background. Involves selecting and mounting the right paper or color wash. Often white is perfect for highlighting the feathers. If not, it is a a matter of what color, texture, and pattern brings out the qualities I am trying to emphasize in the feather. It has to be subtle not to overpower the feathers. Virginia Sarsfield, papermaker in Maine will make feather-paper if I send her some feathers. A family business in India, Under the Sun, has a small selection of papers that I like. I even used wasp nest this year to make my own paper but the wasps really did most of the work. Mount the feathers. This is the second most time-consuming part. I abhor laying naturally curving feathers flat on a board. Their form must be arranged to rise from the background in a natural curl. I mark the exact place where each feather gets placed. Cutouts are glued onto tiny pins, inserted and glued onto the background; feathers inserted shaft-first into the background; or whole or partial feathers glued or pinned according to what is needed. Finished shadowbox pieces are much sturdier than they look although they need protection from bumps with a good frame. 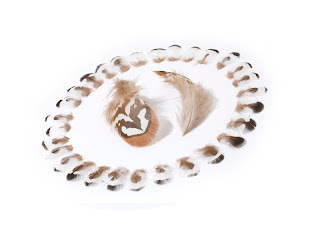 Get your signed copy of Feathers: Form & Function!